The subtitle of this book is “John Sutcliff of Olney, his friends and his times.” Our stop in the beautiful little English town of Olney includes the history of John Newton and William Cowper, but our Baptist interests are in the church that is now called “Sutcliff Baptist Church.” It was in this church that William Carey was set apart to the gospel and where Sutcliff’s call to prayer led Carey, Andrew Fuller, and others to begin praying about world wide missions. 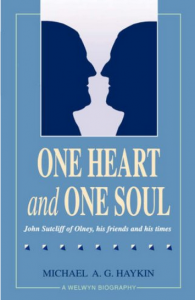 John Sutcliff was the older, wiser pastor who largely guided the heart and soul of the new Baptist Missionary Society that sent Carey to India. The theme of this book, and its great value, is to walk in the shoes of these great men and feel the passion they had for the gospel and the missionary enterprise. For example, after the mission society was founded and Carey was in India, Sutcliff and Fuller were invited to London to ask the more well-to-do churches there for support. To their dismay, the London churches were too intent on congratulating them and honoring them for the missionary society. These great men felt the closeness and selfless sacrifice of the mission was at stake so they declined as much contact with London as possible. Their fears proved to be correct as later there was much division in the London churches over missions. A great lesson for missions in our day.